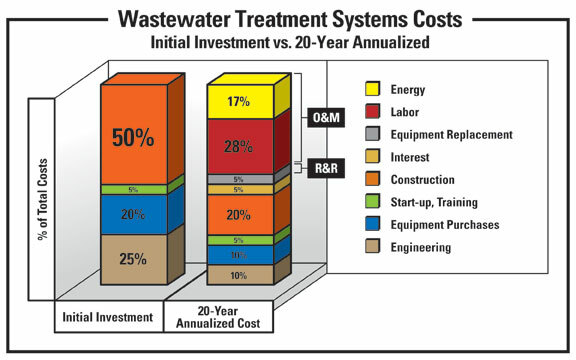 This section focuses on the community costs of having one of the best wastewater treatment systems in the nation and where all that money goes. As of May 2011, there were three charges on the water bill of Schaumburg residents: The first was a $2.48 service charge; the second was a sewer rate of $1.14 per 1,000 gallons of water; and finally the water rate itself of $5.48 per 1,000 gallons of water (Village of Schaumburg). 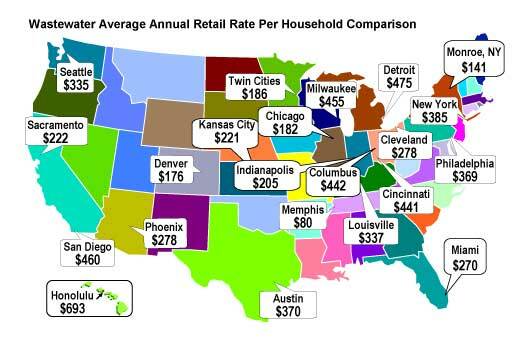 When compared to Chicago, where as of 2010 the water rate was $2.01 per 1,000 gallons or to Madison, Wisconsin’s charge of $2.81 per 1,000 gallons, Schaumburg’s rates are quite high and well above the average for the region and the nation (Moser). With the average American using 94 gallons of water a day, even a single man or woman in Schaumburg would be paying around $256.12 per year, and a small family of three would be paying a little over $750 a year for water and sewage (MDE). And while the sewer portion of the bill is actually quite low compared to other Midwest cities, this is only a fraction of what Schaumburg residents actually pay for sewage treatment. The $1.14 per 1,000 gallons is money paid to the village, which owns and maintains the sanitary and stormwater sewer lines. However, the actual sewage treatment is handled by the Metropolitan Water Reclamation District of Greater Chicago, to which residents pay a portion of their property taxes. The 2010 rate was $2.67 per $1,000 of property value. According to the Zillow Home Value Index, the average home in Schaumburg was worth about $170,000 in 2010, meaning the sewage treatment bill would be about $450 (Zillow). This is in addition to the water bill, making the total, including property taxes paid to the MWRD, over $1,200 per year for the average family of three. For the village of Schaumburg, the median household income for 2010 was at $73,129, while the national average was $50,221 (AreaVibes, U.S. Census Bureau). With the high average median income, that $1,200 may not be a major burden for many families, nor those who are single and working. But according to the U.S Census Bureau, there are nearly 19,000 families in the area and about 4,000 barely make $50,000 a year. For them, the cost of water may indeed be a huge issue, especially with rates going up by another 45 cents in 2012 (U.S. Census Bureau, Village of Schaumburg). But the 45 cent increase would only be a drop in the bucket should the U.S. EPA demand that the MWRD clean up the Chicago River. In addition to owning the John E. Egan Water Reclamation Plant in Schaumburg, the MWRD is also in charge of wastewater treatment for most of Cook County, including the City of Chicago. Unlike suburbs like Schaumburg, which send their wastewater to a state-of-the-art water treatment plant considered one of the best in the Midwest by the EPA, Chicago does not always treat its wastewater. Instead, the MWRD has implemented a system know as TARP (Tunnel and Reservoir Project), where instead of cleaning wastewater during times of heavy rainfall, it only stores it in tunnels under the city where it is combined with stormwater and often dumped into the Chicago River. Many Chicago residents have long complained that the river is basically an open sewer and during times of heavy rain, it can be. Should the EPA mandate that the MWRD stop dumping untreated sewage in the form of Combined Sewage Overflows (CSOs) and invest in more thorough wastewater treatment technology (including final stage disinfection of treated effluent), the districts costs could skyrocket. Because the MWRD costs are passed along to all residents of Cook County, Schaumburg residents would also see a spike in property taxes. The tradeoff for Schaumburg to receive water from Lake Michigan and to have it cleaned through the MWRD is that they must help pay a share of all district projects, which includes Chicago. The cost of completing TARP and adding bacteria-killing chemicals to Chicago’s plant is estimated at about $80 per year per household, a number which would be significantly higher in Schaumburg (Bukro). Nevertheless, assuming the average median income stays at around $70,000 per year, these changes will end up being only about 0.2 percent of the average family’s income. For now, Schaumburg residents get good clean water from Lake Michigan and effective wastewater treatment from the MWRD’s John E. Egan Water Reclamation Plant. That plant has the ability to hold 30 million gallons of water per day and put it through advanced state of the art technology which has been praised by the EPA (WaterandWastewatercom). But with the possible cost increases in the future, it may become a matter of deciding whether the costs are worth it. It would be nearly impossible for the village to change its current method of handling waste from such a dependable system. In the end it will come down to whether the residents will continue paying high water bills, which will likely increase, or instead learn to conserve water to make it more affordable. If conservation methods are implemented and bills can be kept down, it would allow at least some time to look into more economical alternative methods of obtaining and treating water.